McDowell High School was established in 1971, thus the date on the school seal. The school building was scheduled to be completed by the spring of 1971. However, it was not finished until November of 1971. 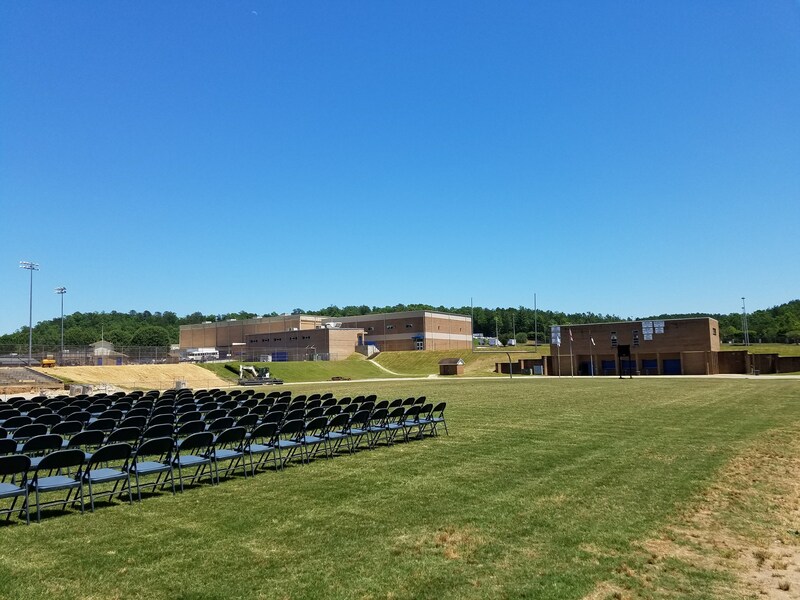 Rather than attempt to relocate in the middle of a school year, the newly consolidated (McDowell County and Marion City) school board decided to delay the move until the following 1972-73 school year. The 6 community schools continued during the 1971-72 school year as McDowell High School with one football team, one basketball team, one yearbook, etc. The seniors received the first McDowell High diploma even though there were actually 6 graduation services. The building was first occupied by the second graduating class of MHS students, 1972-73. Football games were played on the East Jr. High field for the first few years until the MHS football field was constructed. The MHS gym originally had a special red Tartan Floor which permitted any type of shoe to be worn on it. From the beginning and continuing for the first few years, crimson red was the dominant school color with blue and silver as minor accent colors. The official school symbol was a block style red "T" of the same style as the University of Tennessee “T”. 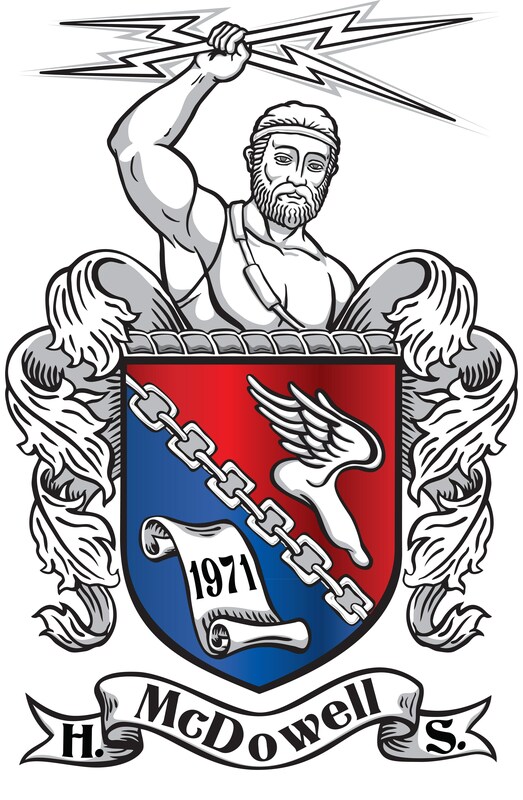 During the fall of 1979, Bobby Norris designed the Titan "Star and M” with a red M on a blue and white star outline and presented it to the athletic department. The new design was adopted and quickly became popular with the school and community. Since then, blue has been the dominant school color with red and silver as minor colors. 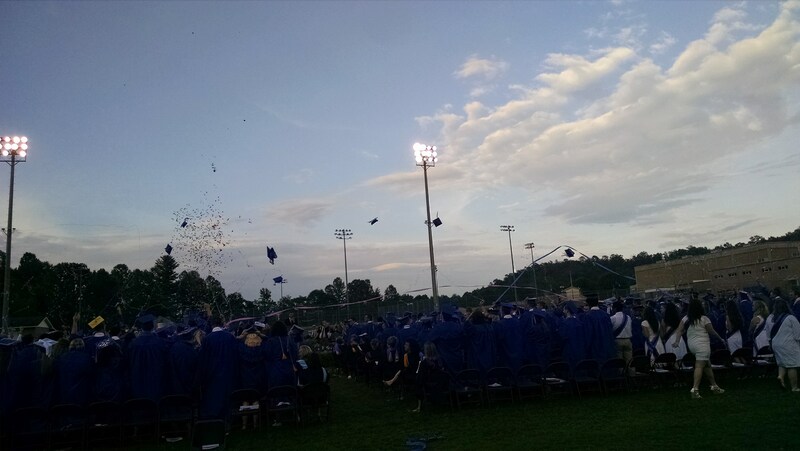 The Titan Star is now proudly worn and recognized by all graduates and citizens of McDowell County as the official Titan emblem. The first official performance of the McDowell High "Alma Mater" was on November 11, 1976, during a McDowell High School Band Concert. The first live performance of the McDowell High "Alma Mater" took place during a football game in the fall of 1976. The words were composed by Mrs. Alice Ostrom, a noted North Carolina poet, and Angela Israel, a student of Captain Ostrom. The musical score was composed by Capt. Ralph K. Ostrom, Ret. In addition to having served as band director at Marion High, Captain Ostrom studied with the United States Army Band and was director of the Tenth Division Band Training School. Captain Ostrom died in December, 1984, at the age of 76.